We talk all the time her about organizing, creating systems and routines. If you have read any of my posts, you know I am a huge fan of planners…paper planners. I also love my lists and I can’t stand clutter. And I know without a doubt that so many of you are the same way! That is why I am so excited to share this with you all today! If you are tired of wasting precious time shuffling papers and looking for your child’s missing shoe, you’ll love this. You dream of short-cuts to make your life more organized, but is it possible? I know as a busy mom, I need organization in my life. But not just organization…I need systems and simplicity. I can’t add one more thing to my already busy day…but I would love to streamline it. I would love that perfect planner! You’ve got great reasons for wanting to be more organized. You want the best for your family. You want to teach your kids to live in calmness, not chaos. You want to be patient without losing your mind in the insanity of so much stuff. And you just want to savor the time you have, instead of running around chasing clutter. This is where it gets exciting! We have an answer and it’s simple! What if you could learn from a group of organizing experts all at once — regular people who’ve found practical solutions to their everyday struggles, and want to share their best tips and tactics with you in all the areas you find most challenging? This Conquer Your Clutter Super Bundle is being offered for the very first time. So many have been begging for help with streamlining their lives. The answer was this super-short opportunity to get a complete collection of organizational resources for a crazy low price. Besides being so incredibly helpful and inspiring, one of the things I like best about the bundle is the price. By offering the bundle for a short time only, they’re able to give you access to over $650 worth of amazing products for a whopping 95% off! This is a CRAZY deal! As a large family mom, I am always so grateful when I can save some money on something that will be valuable. Make sure to hurry and grab your bundle! Then let’s chat about all the stuff in it! I must say I’m also a clutter bug! I’m getting better though! I find my daughter is much happier when there’s less chaos in the house! I hate clutter! I am in the process of decluttering as we speak! Great tips. Nothing better than an organized house! Thanks for these tips! Perfect timing as I’m sure most of us are trying to get motivated to get organized! This is awesome! I can’t go anywhere without my planner! Thank you for the wonderful organization tips! awesome deal! I hate clutter, too! I’m constantly thinking about how i can tackle it. Oh my gosh, clutter is my life. I love this! We are trying really hard to declutter our house right now. Thank you so much for sharing. Yes! I hate clutter, it just seems to pile up as I tackle more important tasks. I want to make decluttering a weekly if not daily task. Clutter is definitely a challenge! You have some great tools available. I’ve been a YNAB user for about 3 years now and love it! Wow! That is a huge bundle! And 95% off is amazing! Thank you for sharing! I’m trying to declutter…my life, my house, etc. Thanks for sharing your tools! Clutter is the worst! It drives me crazy, but it can be hard to combat the problem. Thanks for sharing this great deal. 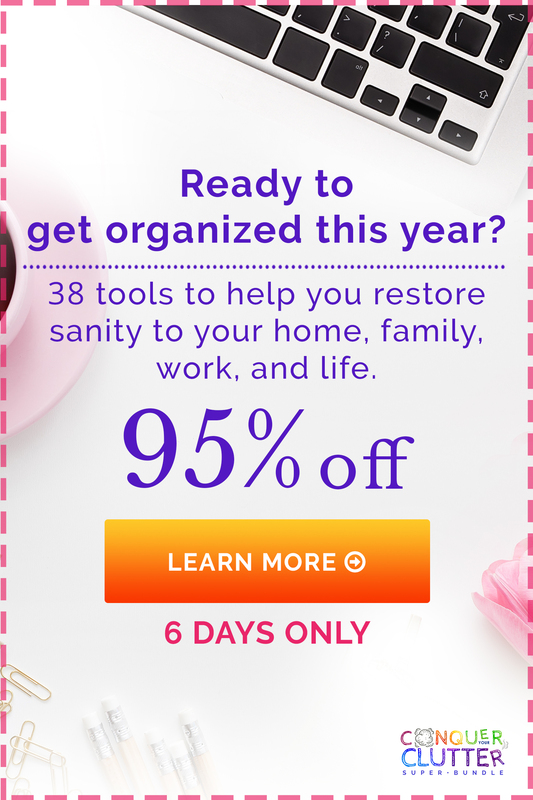 These is an awesome bundle and can help me with my organization. Every time I conquer clutter, it returns with a vengeance! If they create an Addicts Anonymous group for people with issues of disorganization, I would be the first person to sign up. Lol. I am a clutterbug, but fortunately, My family as a very small apartment. I get rid of things regularly just to keep it at an acceptable level! That is a phenomenal deal for the bundle. I love ultimate bundles – they always offer such a great deal for a lot of information! This is another great bundle! Thanks for the great tips! I’ll admit… I’m a hoarder and gather a lot of clutter. Its a work in progress though and I find the older I get… The less I keep and more I get rid of. Great post! I hate clutter! Thank you for the great tips!! I would love to be able to buy that bundle. It looks like it has so many helpful resources in it.